MIDAS PRO X Rocks Wawa Welcome America! 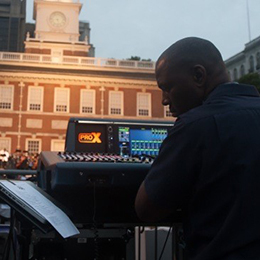 MIDAS’ flagship console, the PRO X, was put to use as America’s largest pops orchestra, The Philly POPS, opened festivities for Wawa Welcome America, Philadelphia’s citywide Fourth of July celebrations. 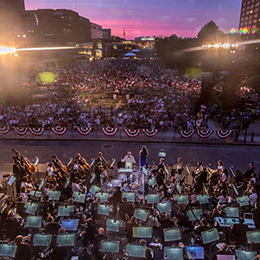 The 65-piece Philly POPS is the largest pops orchestra in the United States which boasts a repertoire of songs from colonial times up through today’s chart toppers. 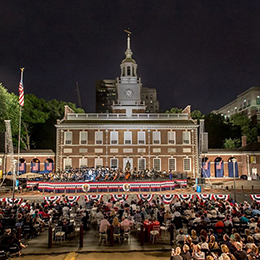 Against the dramatic backdrop of Independence Hall, the POPS performed a lively score of well-known tunes to the town’s crowd, which gathered for one of the main highlights of the week-long patriotic festival. Andre Houser, chief engineer of Houser Audio, has overseen the sound design and served as FOH engineer for The Philly POPS over the last eight years as the orchestra has grown to serve an audience of over 100,000 per year.